Mt. Carmel Novena, Day 8 -- "Mother of Mercy"
Mt. 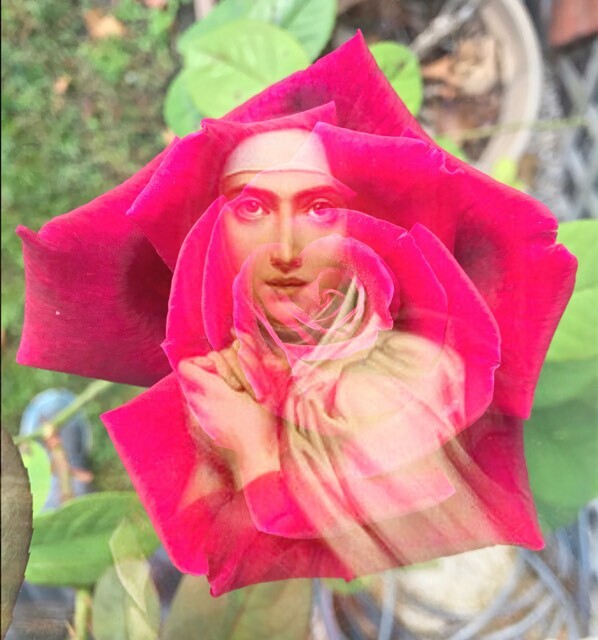 Carmel Novena, Day 6 -- "The Mystical Rose"
Mt. Carmel Novena, Day 5-- "The Morning Star"
Mt. Carmel Novena, Day 4-- "Mother of Fair Love"
Mt. Carmel Novena, Day 3-- "Star of the Sea"
John Soreth was born at Caen in Normandy and entered Carmel as a young man. 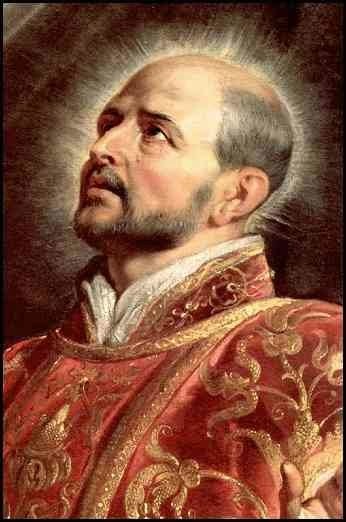 He pursued a doctorate of theology in Paris and served as regent of studies and provincial of the province. He was prior general from 1451 until his death at Angers in 1471. He restored observance within the Order and promoted its reform, wrote a famous commentary on the Rule, issued new Constitutions in 1462, and promoted the growth of the nuns and the Third Order. Here he is in his prison uniform. Blessed Titus was a towering intellect as well as a man of humor, wit and sanctity. He stood up to the Nazis; they put him in Dachau and performed experiments upon him. Before he died, he handed his rosary to the prison nurse and she was converted. He is a saint for our time. Although neo-paganism no longer wants love, history teaches us that, in spite of everything, we will conquer this neo-paganism with love. We shall not give up on love. Love will gain back for us the hearts of these pagans. Everybody needs a Jewish grandmother. There is no need too small or insignificant for St. Anne to concern herself with; she is at home among the pots and pans, in the garden, the grocery store, and especially in the labor and delivery room. I can even see her standing in the living room in the middle of a family fight, trying to intervene. She is powerful with God. Her shrine in Quebec is among the most beautiful in the world. St. Anne, Beauty of Judea, Mother of the Virgin, pray for us! 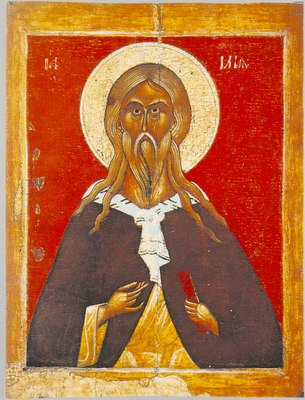 Today is the feast day of Saint James the Greater. Millions of pilgrims have trekked across four ancient pilgrim paths that thread through Europe, converging in the Pyrenees, then across northwestern Spain to the tomb of St. James at his shrine in Santiago de Compostela (St. James of the Starry Field). Modern pilgrims walk the Camino, “The Way of St. James,” in the footsteps of great pilgrims of the past, including St. Godric of Norfolk, El Cid, St. Francis of Assisi, John of Gaunt, and Lorenzo de Medici. Henry II, father of Richard the Lionhearted, offered to make the pilgrimage in expiation for the murder of St. Thomas Becket. Historians credit the forging of a common European identity to the Camino de Santiago. Through the centuries Christian pilgrims have built great monasteries, abbeys, and hospitals along these roads, along with a shared culture—art, architecture, fashion, literature, and faith. Pilgrimage fervor suffered when the Reformation split Europe, dividing European identities and loyalties. Interest surged again in the 1980s; today more than a quarter million pilgrims a year set off for Santiago where archeologists have found inscriptions for the Apostle’s two disciples, and where Christians believe the Son of Zebedee himself lies in a silver casket. The apostle James, along with his brother John, and Simon Peter were Jesus’ confidantes. They alone among the apostles were present at the Transfiguration and in the Garden of Gethsemane. James preached in Spain after the disciples went forth following the Resurrection. He was beheaded by Herod Agrippa in 42 A.D., the first apostle to die, the first apostle martyred. His followers returned James’ body to Spain, burying his remains in Galicia in the northwestern corner of the peninsula. And there the apostle lay forgotten until 813, when most of Spain groaned under the Saracen boot. A Muslim storm burst from North Africa over most of Iberia in 711 A.D. taking Christians captive, pillaging towns and swarming north over the Pyrenees into France. By 800, Christians had been backed into the northernmost region and a humiliating tribute of a 100 virgins per year was demanded of local governors. Look you, my body is in Galicia, but no man knoweth where and the Saracens oppress the land…the starry sky signifies you shall go to Galicia at the head of a great host and after you all peoples shall come in pilgrimage even till the end of time…and your name shall abide in the memory of man until the Day of Judgment. The warrior emperor was to liberate the roadway that ran to the tomb. In Galicia, James’ burial crypt had been rediscovered in 813 and a small chapel was built (by Bishop Teodomir) to protect it. 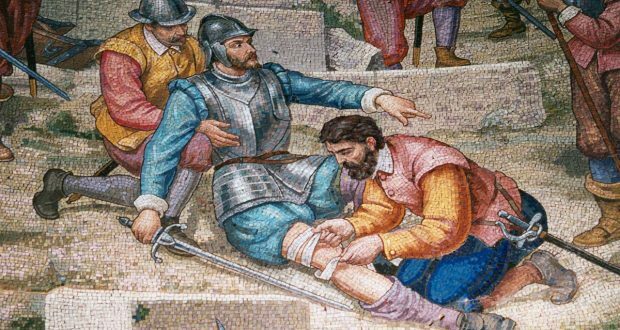 Myth or miracle, a rout now known as the Battle of Clavijo was fought in the year 844 by desperate Christians with their backs against the mountains, led by Ramiro 1 of Asturias. Suddenly, there appeared a heavenly horseman, sword aloft, who slew every Muslim in his path: Santiago Matamoros. Inspired by their champion, the faithful began the reconquest of Spain. An additional problem with our worship today is that God has become almost an afterthought. Much of our liturgy is self-centered, self-congratulatory, and anthropocentric (rather than theocentric). We are “the aware, gathered community celebrating itself.” While the Mass should focus on God and summon us to humility and joy before Him, too often it seems more an exercise in self-congratulation. We are very narcissistic, even in a communal setting. God cannot be pleased with all of this. Even if our worship is rightly ordered, we are not going to buy Him off that easily. God wants an obedient heart more than sacrifice. Sacrifice without obedience is a sham. 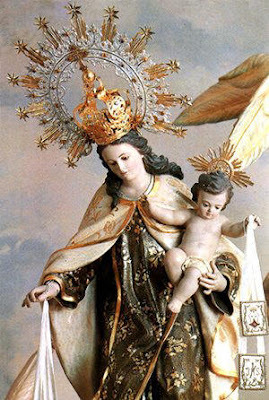 It is the octave day of the feast of Our Lady of Mount Carmel. On this day Carmelites have traditionally celebrated the memorial of Our Lady, Mother of Divine Grace or "Mater Gratiae." 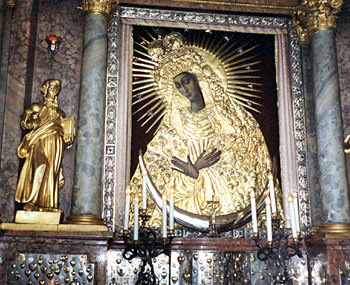 Here is an article about the mysterious and miraculous Austrian painting called "Our Lady of the Bowed Head" which has become associated with this day. Since the time of St. Luke, thousands of pictures and statues of the Blessed Virgin Mary have been carved, painted, or fashioned in some way, by all kinds of different people from around the world. Some of these pictures become famous, usually due to some form of miraculous intervention. 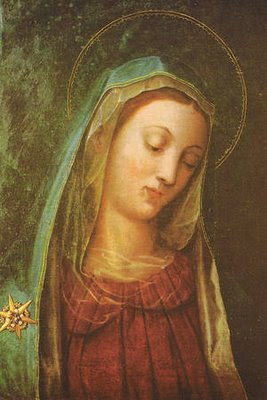 One such picture is Our Lady of the Bowed Head, from Vienna, Austria. 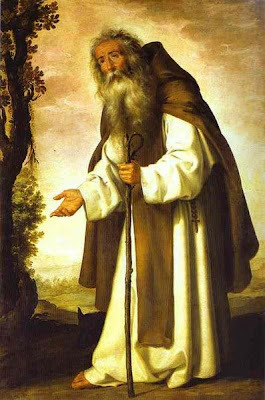 A Carmelite Monk, Venerable Dominic of Jesus and Mary, found one in 1610. He was looking over an old broken down house which he wanted to convert into a Carmelite Monastery. Fr. Dominic walked around the outside of the house and passed by a pile of garbage, but paid no attention to it. But as he entered the house and started looking over the rooms, suddenly he felt the urge to go back to the pile of garbage. Lighting his lantern, the good priest took a closer look at the heap of garbage. Suddenly his eyes fell upon an old oil painting of the Blessed Virgin Mary..."Who would throw a beautiful picture of Our Lady in the garbage," he wondered. Then Fr. Dominic apologized to Mary, "I am sorry, dear Mother, that someone has treated thy image in such a terrible manner. I will take it back to the monastery with me and fix it up, and I will give thee the homage which thou so rightly deserve." After returning to the monastery, Dominic cleaned the picture and repainted the damaged parts. Now he could hang the picture up in his cell and give Mary the devotion and attention which she deserved. 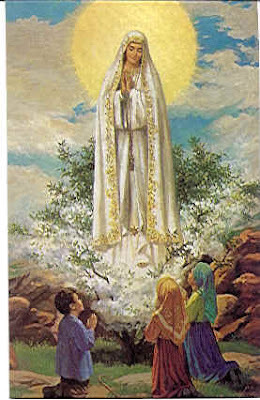 He prayed to the Madonna with great confidence, asking her for many graces and blessings. One evening when he had just finished sweeping his cell, Fr. Dominic noticed that the picture of Our Lady had some dust on it. He was crushed, "Oh, I’m terribly sorry my dearest Mother!" He exclaimed. "I humbly beg thy pardon for forgetting to dust thy picture." Then taking out his handkerchief he began to dust the picture saying, "O purest and holiest of Virgins, nothing in the whole world is worthy to touch thy holy face. Dear Mother, I only have this coarse, old handkerchief and I beg of thee to please accept my good will in dusting thy image." Fr. Dominic continued dusting the picture of Mary, when suddenly the face of Our Lady came to life! She smiled at the holy priest and nodded her head as a sign of thanksgiving. Dominic was afraid that what he was seeing was a trick of the devil. But Our Lady cleared up his doubts saying, "Fear not, my son, for your request is granted! (Dominic had earlier requested a favor of her.) Your prayer will be answered and will be part of the reward, which you will receive for the love that you have for my Son Jesus and myself. Now Dominic I want you to ask me with all confidence, what favor you would like me to give you." The holy monk then fell upon his knees. "O my dear Mother, I offer myself entirely to thee and to thy dear Son Jesus, and I desire to do anything that thou and Jesus will ask of me. O my Lady, I know that the soul of a benefactor is suffering in Purgatory. Wouldst thou please be so kind as to deliver this soul from the fires of Purgatory?" 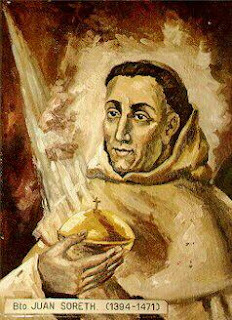 "Dominic, my son," Our Lady encouraged, "I will deliver this soul from Purgatory, if you will make many sacrifices and will have many Masses offered for this soul." Then the apparition of Mary faded away. The good monk hurried to do as Our Lady had asked. Some time later, when all had been completed, he again knelt before the miraculous painting of Our Lady. Suddenly Mary appeared to him again, but this time she appeared with the soul of the special benefactor, whom she had delivered from Purgatory. The benefactor was grateful, "Thank you, Fr. Dominic, for helping to release my soul from the fires of Purgatory with your prayers and sacrifices." "Dominic," Our Lady encouraged, "I would like you to ask me for more favors and blessings. I am the Mother of God and I delight in helping my children to obtain graces for their salvation." Fr. Dominic thought for a moment and then spoke, "Dear Mother, wouldst thou please be so kind as to listen mercifully to the prayers of all those who will honor thy image and ask for thy help." Our Lady replied, "All those who ask for my protection and honor this picture with devotion will obtain an answer to their prayers and will receive many graces. Moreover, I will pay special attention to the prayers which are offered to me, for the relief of the souls in Purgatory." The vision of Our Lady soon disappeared and Fr. Dominic thought about what he should do: "Our Lady made her promises to all who would honor and pray to her, before this miraculous image. Therefore, I can no longer keep this holy picture in my cell, I must have it put in a church, where the people can honor it. " In the materialistic society in which we must work out our salvation, we have forgotten, if we ever knew at all, what it is to truly fall in love with God. The woman of Magdala, the courtesan of the Roman resort, knew the unhappiness and degradation of being exploited and used. The love of the Son of God, restoring her human dignity with His words and glance, caused her to throw herself at His feet, even as she shattered the jar of alabaster. With the precious ointment she gave her entire self in a complete oblation. ...And the house was filled with the odor of the ointment. (John 12:3) The fragrance of her repentant love continues to emanate throughout the entire Church, the house of God, especially in the person of the consecrated religious, and all those who kneel in awe before the Blessed Sacrament. The ancient tradition of the church tells of how the Magdalen, after Our Lord's Ascension into Heaven, went to the South of France and lived in solitude and contemplation in a cave on a mountain. 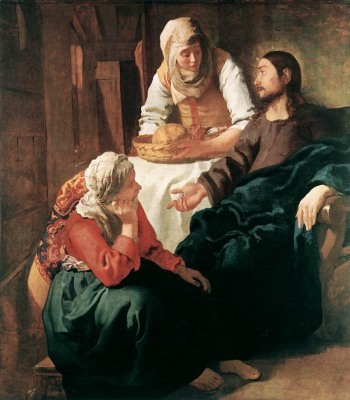 It is that region in which was born the culture of chivalry and courtly love, St. Mary Magdalen was named the patroness of lovers, not of unsanctified love but of chaste love, of the love that requires sacrifice, unselfishness and renunciation in which to thrive. She represents the spiritual love which enhances the beauty of the union of bride and groom, that union which foreshadows nothing less than the union of Christ with His Bride the Church in the Paradise of eternity. 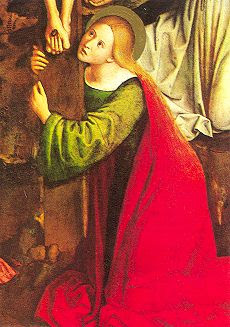 In the Litany of the Saints, St. Mary Magdalen's name appears before the list of all the virgins, so highly prized is her humility and repentance by the Church. May she pray for all woman and girls who are being exploited and for our society, enslaved by its worship of license, a license which is opposed to true freedom. May she pray for my ongoing conversion, and accept this small virtual votive light for all the intentions I offer her today. Elias, called "the Thesbite," first manifested himself during the three year drought and famine by which the God of Israel punished His erring people, who had been led into idolatry by King Ahab and Queen Jezebel. 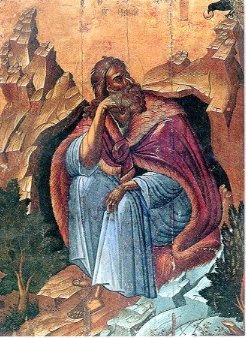 (3 Kings 17:1) Described as "a hairy man" (4 Kings 1:8), he usually could be found praying in remote desert and mountain retreats. It was in the solitude of Mt. Horeb that he experienced the majesty of God, not in fire or earthquake, but in the serenity of a "whistling of gentle air." (3 Kings 19:12) His usual haunt seems to have been Mt. Carmel, where he had the famous contest with the 450 prophets of Baal. (3 Kings 18:19) He defeated them by calling down fire from Heaven (3 Kings 18:38), setting the precedent for those who wish to follow in his footsteps as "Carmelites," whose role is to pray for the fire of graces, especially in times of crisis for the Church. As Elias is carried away in the whirlwind, he bequeaths to Eliseus his mantle, along with his "double spirit." (4 Kings 2:13) Eliseus continued the work of fighting idolatry, working many miracles which surpassed those of his master. Can the mantle of Elias be seen as prefiguring the brown scapular, which symbolizes the spirit of prayer and penance, the spirit not only of Elias, but of Mary? 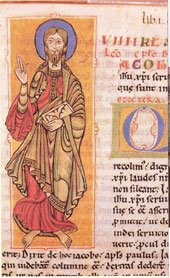 Most of the early fathers of the Church identify Elias as one of the "two witnesses" in Chapter 11 of the Apocalypse, who do battle with the Antichrist. The two witnesses are martyred by the son of perdition, but their resurrection and ascension into Heaven ushers in the final defeat of "the beast." (see Apocalypse 11) The exact manner in which such cryptic prophecies will be fulfilled remains to be seen. It is interesting, however, that Carmelites have always used red vestments on July 20 in honor of the martyrdom of Elias that is to come. We are compelled to ponder today what can only be called a core text of the liturgical and spiritual tradition of Carmel. I refer, of course, to the lesson from the Third Book of Kings. This is a text — no, more than a text, a living word — that has, over the centuries, captured the heart of those called to live on Carmel’s heights. Its context is important. First of all, a terrible drought has come over the land; God withholds his life–giving rain. Over the land ruled by Achab, a weak king, influenced by his wife’s devotion to the great sky–god, Baal, the heavens are closed. Elias determines that this state of affairs must be resolved. The true God, the God of Israel must be glorified in the sight of all. «And Elias coming to all the people, said: How long do you halt between two sides? If the Lord be God, follow him: but if Baal, then follow him. And the people did not answer him a word» (3 Kings 18:21). I have long been an admirer of Gertrud von le Fort and her novel Song at the Scaffold, about the Blessed Martyrs of Compiègne. 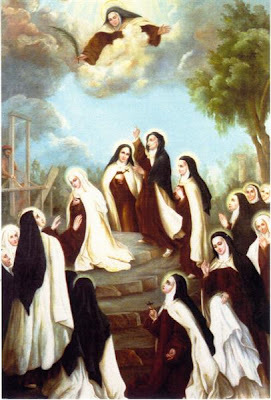 Baroness von le Fort's short but powerful depiction of the sixteen Carmelite nuns guillotined in 1795 during the Reign of Terror was the inspiration for the play by Bernanos and the opera by Poulenc, Dialogues des Carmelites. To Quell the Terror by William Bush is an excellent historical treatise on the martyrdom of the Carmelites. 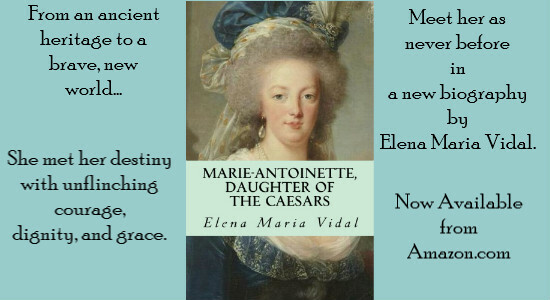 It is not widely known that Queen Marie-Antoinette provided a dowry for a poor, pious girl named Mademoiselle Lidoine, so that she could enter the Carmel of Compiègne. Mademoiselle Lidoine became the Mother Prioress of the heroic Martyrs of Compiègne, who like Marie-Antoinette, died on the guillotine during the French Revolution. There is more HERE from The Inn At The End of the World. HERE is the final scene from Poulenc's opera. Baroness Gertrude von Lefort (1876–1971) is the author of over 20 books (poems, novels and short stories), honorary Doctor of Theology and «the greatest contemporary transcendent poet». Her works are appreciated for their breath-taking profoundness and virtuosity, beauty and actuality of her ideas, and for the sophisticated refinement of the form. Hermann Hesse, who evaluated her talent, proposed her as a candidate for the Nobel Prize. 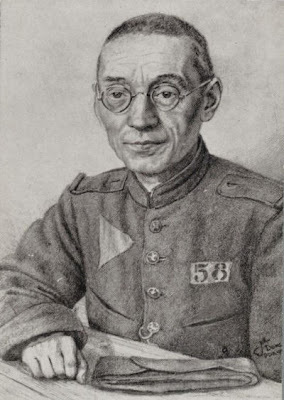 Von le Fort was born in Westphalia, Germany, and studied at the Universities of Heidelberg and Berlin. A Protestant of Huguenot descent, von le Fort converted early to Catholicism.Her novel Die Letze am Schafott (The Last or Song at the Scaffold), by far her most famous work, was the basis for Dialogues of the Carmelites. Set during the time........... of the French Revolution, the von le Fort novel tells the story of a troubled, frightened, and strange girl, Blanche de la Force, who has lived in fear from the moment of her birth. To overcome her affliction, she decides to become a nun of Carmel. Little does she know that she is no safer from fear at this convent than in the secular world. The character of Blanche was von le Fort’s creation, but the other nuns in the story historical figures. Notice the similarity of "von le Fort" to "de la Force." This was no coincidence: much of Gertrud von le Fort’s inspiration for her novel came from her own experiences during World War II and her hatred of Nazism. She recorded the origin of her 1931 novel: "The point of departure for my creation was not primarily the destiny of the sixteen Carmelites of Compiègne but the figure of the young Blanche. In a historic sense she never lived, but she received the breath of life from my internal spirit, and she cannot be detached from the origin, which is hers. Born in the profound horror of a time darkened by the signs of destiny, this figure arose before me in some way as the embodiment of the mortal agony of an era going totally to its ruin." Here is a novena to the mother of the Blessed Virgin Mary in preparation for the feast of St. Anne on July 26. St. Anne is the patron saint of grandmothers and she intercedes for us as only a grandmother can. If we look for the earliest references to the scapular, we find them in the Carmelite constitutions of 1281 in which it was prescribed that all Carmelite friars should wear their tunics and scapulars to bed under penalty of a serious fault. It was also prescribed that the white mantle be made in such a way that the scapular would not be hidden. But the reason for these prescriptions was not a Marian one. At the time, the scapular was seen as signifying the "yoke of Christ." This yoke of Christ in turn pointed to obedience. And that explains the strictness of the legislation. Taking off the scapular was like taking off the yoke of Christ, or rebelling against authority. Only gradually did the scapular take on a Marian tone and grow until it reached such a point that it became identified with Carmelite piety toward Our Lady. 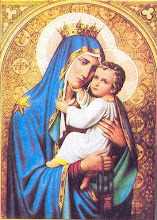 In fact the feast of Our Lady of Mount Carmel began to be called the scapular feast. Devotion to Mary expressed by wearing the brown scapular seems to be resilient and resists the attempts made in various periods of history to diminish its value. The faithful keep coming back to it. From the official teaching of the Church, we can gather that the scapular of Carmel is one of the most highly recommended Marian devotions. This is true through the centuries, and into our own times with popes Paul VI and John Paul II. One of the early Carmelites in his enthusiasm went so far as to call the scapular a "sacrament." Actually the category into which the scapular fits is that of a sacramental. Sacramentals are sacred signs. The scapular is not a natural sign in the sense that smoke is the sign of fire. Smoke is intrinsically connected with fire. Where there's smoke there's fire, the saying goes. Sacramentals also signify effects obtained through the intercession of the Church, especially spiritual graces. 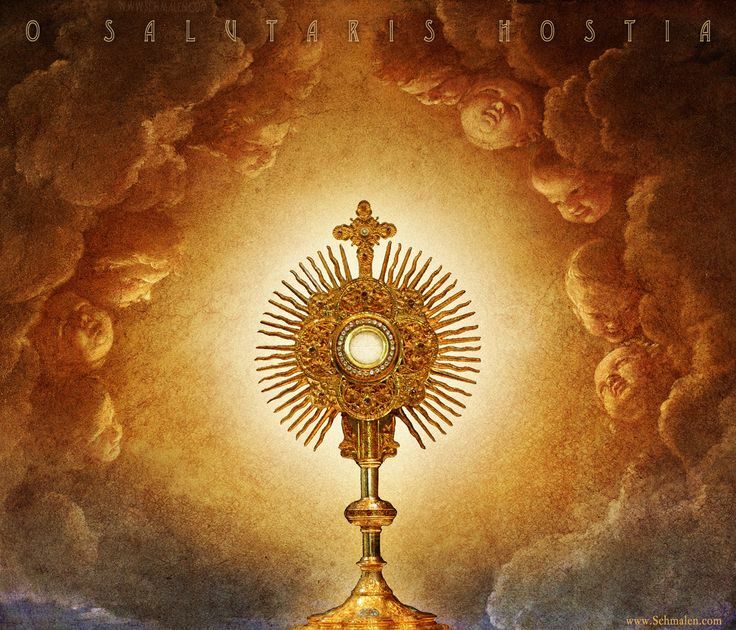 The sacramentals -- as holy pictures or icons, statues, medals, holy water, blessed palm and the scapular -- are means that dispose one to receive the chief effect of the sacraments themselves, and this is closer union with Jesus. 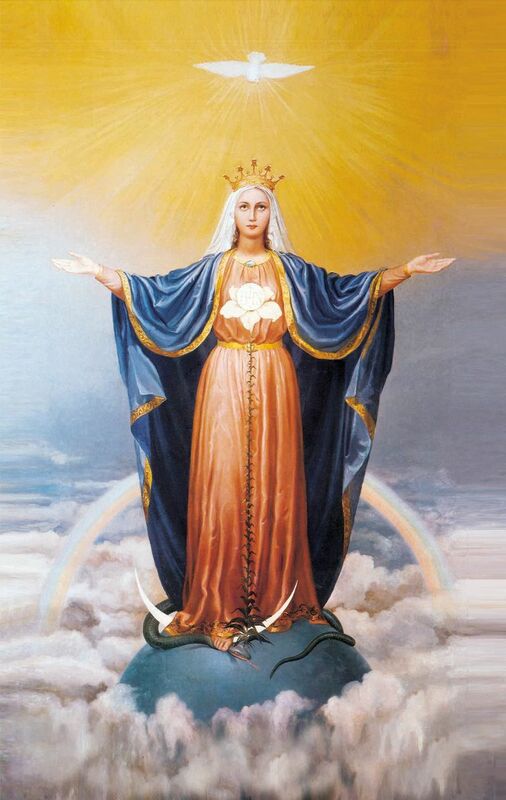 ...A splendid example of this Marian spirituality, which inwardly moulds individuals and conforms them to Christ, the firstborn of many brethren, is the witness to holiness and wisdom given by so many Carmelite saints, all of whom grew up in the shadow and under the protection of their Mother. I too have worn the Scapular of Carmel over my heart for a long time! Mt. Carmel Novena, Day 9 -- "Queen and Beauty of Carmel"
The essence of the mystery of Carmel is the cultivation of the interior life, to find God in the Heaven of one's soul amid the vicissitudes of this earthly pilgrimage. As Our Lord said, "The Kingdom of God is within you." 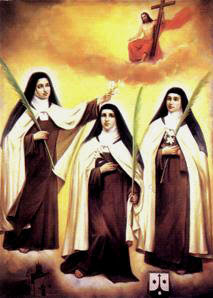 (Luke 17:21) The twin goals of the Carmelite order, according to medieval authors, were to offer to God a heart free from all stain of actual sin, and to experience, even in this world, the supernal joys of union with God. These goals, of course, are beyond human strength, and completely impossible to obtain on our own. God, therefore, has given us His Mother to be our guide up the mountain of perfection. While all are not called to the contemplative life, all the baptized are called to pray and strive for holiness. The Blessed Virgin is a Mother who clothes us with grace and takes our supernatural life under her protection, in order to bring it to its full flowering in eternal life....Devotion to Our Lady of Mt Carmel indicates a strong call to the interior life, which, in a very special way, is Mary's life....Only the soul that is wholly detached and in complete control of its passions can, like Mary, be a solitary, silent 'garden' where God will find His delights. This is the grace we ask of Our Lady today when we choose her to be the Queen and mistress of our interior life. We fly to thy protection. O Holy Mother of God. Despise not our petitions in our necessities, but deliver us always from all dangers, O ever glorious and blessed Virgin. Queen, Beauty of Carmel, pray for us! In the Carmelite church in Vilnius in Lithuania is a magnificent and miraculous painting of Our Lady hailed as Mater Misericordiae, or "Mother of Mercy." The church is built into the wall near the old eastern gate of the city; therefore the image is also known as Our Lady of "Ostrabrama," of "the Dawn Gate." She is covered with votive offerings left by grateful clients over the centuries, for to her both the Slavic and Baltic peoples have turned in times of war, sickness, oppression, and indeed, every and any calamity. Many saints have knelt before her, including the Carmelite St Raphael Kalinowski, and St Faustina of the Divine Mercy revelations. Through the means of sacred art, Our Mother has manifested herself to her needy children of all times and places. It is permitted to the Carmelite Fathers to preach that the Christian people may piously believe in the help which the souls of brothers and members, who have departed this life in charity, have worn in life the scapular, have ever observed chastity, have recited the Little Hours [of the Blessed Virgin], or, if they cannot read, have observed the fast days of the Church, and have abstained from flesh meat on Wednesdays and Saturdays (except when Christmas falls on such days), may derive after death -- especially on Saturdays, the day consecrated by the Church to the Blessed Virgin -- through the unceasing intercession of Mary, her pious petitions, her merits, and her special protection. What a consolation that Our Lady's help and mediation extends to us beyond the grave, especially when we wear the badge which St Simon Stock in the 13th century is said to have called a privilegium. 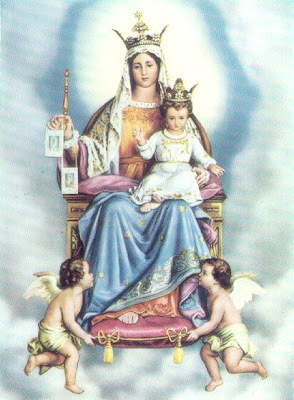 By wearing the scapular, we mark ourselves as "vassals" of Our Queen, and she binds herself to protect us always. From the ancient Carmelite hymn, Salve, Mater Misericordiae: "Hail, happy Mother...He Who sits at the right hand of the Father, and rules Heaven and earth forever, came in thy womb to dwell." Mother of Mercy, pray for us! Carmel means "garden of God." Mt Carmel in ancient times was covered with flowers, and so became a figure of feminine beauty. 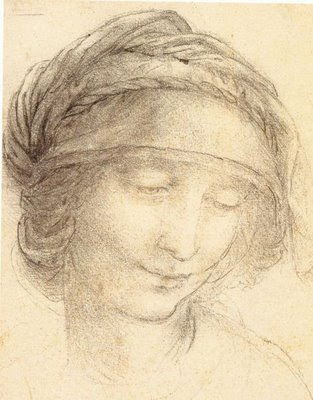 "Thy head is like Carmel....How beautiful art thou, and how comely, my dearest, in delights." (Canticle of Canticles 7:5-6.) The rose has become a symbol of the beauty, love, joy, and sacrifice of the Blessed Virgin, just as the lily is the symbol of her purity. "Mystical Rose" is one of her titles in the Litany of Loreto. The rosary, the favored prayer of Heaven's Queen, comes from the Latin word rosarium or "rose garden." The glory of God's creation is only a shadow of the spiritual realities which we cannot see, but which we can mystically possess even in the present darkness. Our Lady has long been hailed as Stella Matutina, "the Morning Star," for she heralded the end to the long darkness of original sin which preceded the coming of the Savior. In our world and in our lives, there is still darkness, there are nights which seem implacable and never-ending, but the length and darkness of the night only makes the Star shine brighter. We are daily confronted with the night of unbelief and the darkness of paganism which exist in the world; no material darkness can equal the spiritual night of faithlessness. Then there is the darkness of sin, the darkness of slavery to sin, which creates such a blindness that reason and logic are rendered futile. The Mother of God never ceases her intercession, and is the Advocate of Sinners. As for those who have been freed from the bonds of mortal sin through repentance and confession, the struggle against the world, the flesh and the devil continues to rage, often creating a sort of darkness. This can be part of the "dark night" of which St John of the Cross wrote so eloquently, which is the purification of those souls who have given themselves to God, who are striving to love and serve Him. The night can include the abandonment and betrayal by friends and family, the loss of loved ones, the continuation of impossible and annoying situations, the sense of being forsaken even by God, the feeling that one's prayers are not being answered, dryness and lack of devotion when one does pray. All one can do is keep praying and persevering in the practice of the Catholic faith, looking to Our Lady who tells us that the night will not last forever. Star of the Morning, pray for us!